Background: The classification of antineutrophil cytoplasmic antibody-associated vasculitis (AAV) and polyarteritis nodosa (PAN) for epidemiology studies is confusing. The existing schemes such as American College of Rheumatology (ACR) criteria, Chapel Hill Consensus Conference (CHCC) definitions and Lanham criteria produce overlapping and conflicting classifications, making it difficult to compare incidence figures. Aim: To develop a consensus method of using these criteria and definitions for epidemiological studies to permit comparison without confounding by classification. Methods: A stepwise algorithm was developed by consensus between a group of doctors interested in the epidemiology of vasculitis. The aim was to categorise patients with Wegener’s granulomatosis, microscopic polyangiitis (MPA), Churg–Strauss syndrome (CSS) and PAN into single clinically relevant categories. The ACR and Lanham criteria for CSS, and ACR criteria for Wegener’s granulomatosis were applied first, as these were considered to be the most specific. Surrogate markers for Wegener’s granulomatosis were included to distinguish Wegener’s granulomatosis from MPA. MPA was classified using the CHCC definition and surrogate markers for renal vasculitis. Finally, PAN was classified using the CHCC definition. The algorithm was validated by application to 20 cases from each centre and 99 from a single centre, followed by a paper case exercise. Results: A four-step algorithm was devised. It successfully categorises patients into a single classification. There was good correlation between observers in the paper case exercise (91.5%; unweighted κ = 0.886). Conclusion: The algorithm achieves its aim of reliably classifying patients into a single category. The use of the algorithm in epidemiology studies should permit comparison between geographical areas. Epidemiological studies suggest that the occurrence of antineutrophil cytoplasmic antibody (ANCA)-associated vasculitis (AAV; Wegener’s granulomatosis, microscopic polyangiitis (MPA), Churg–Strauss syndrome (CSS) and polyarteritis nodosa (PAN) may vary between regions. Wegener’s granulomatosis may be more common in the north of Europe, whereas MPA is more common in the south1; PAN is now very rare.2 Such variation in the prevalence of disease may reflect the underlying environmental or genetic factors. However, the classification of AAV has been an area of controversy for the past 15 years; it is recognised that the methods used in the classification of AAV may differ between centres and the results of epidemiology studies must be interpreted with this in mind. In 1990, the ACR published classification criteria for vasculitis.3 These criteria did not include MPA or ANCA. The ACR criteria for Wegener’s granulomatosis and CSS have a specificity of 92.0% and 99.7%, respectively, with a sensitivity of 88.2% and 85.0%.4,5 The criteria for PAN perform less well, with a specificity of 86.6% and a sensitivity of 82.2%.6 In 1994, the Chapel Hill Consensus Conference (CHCC) produced definitions for vasculitis.7 They included MPA, but were not intended as classification criteria. They recognised that histological data would not be available for all patients, especially when the clinical condition of the patient might preclude obtaining appropriate biopsy samples or when the sample might not be representative and might miss salient histological features. The concept of surrogate markers of vasculitis was therefore introduced, but a list of markers was not provided. In addition, the importance of ANCA in diagnosis was recognised. However, neither surrogate markers nor ANCA were included in the definitions. Although the ACR criteria and CHCC definitions are widely used, there is no agreement as to how they should be applied. There have been two major attempts at adapting the CHCC definitions for classification. Hagen et al8 used the CHCC definitions in a study assessing the standardisation of ANCA assays. The same methods have been used in the EUVAS clinical trials.9 The authors accepted that histological data were not available for all patients and used surrogate markers for vasculitis. There was no attempt to validate this scheme, and use of ANCA was specifically excluded. In fields such as epidemiology, accurate and comparable classification is crucial to the interpretation of results from different groups. To discuss these issues, a group of doctors interested in the epidemiology of vasculitis met at the European Medicines Agency in September 2004 and January 2006. The aim of these meetings was to develop a consensus on the application of the CHCC definitions and the ACR criteria for AAV and PAN, which could be used to facilitate the comparison of epidemiological data. The underlying principles were that each patient should be classified only into a single category and that there should be a minimum number of unclassified patients. The group did not set out to develop new criteria, but to agree on a common method for using the existing, albeit imperfect, tools, incorporating, where necessary, surrogate markers and ANCA. The final outcome was an algorithm that could be readily applied to all patients with a diagnosis of AAV and PAN. It was agreed initially that the algorithm was to be used for patients with a clinical diagnosis of AAV and PAN, for the purpose of classification in epidemiological studies. PAN was included in the algorithm because patients classified as PAN by ACR may have MPA by the CHCC. By consensus it was agreed to apply the classification criteria for individual diagnoses in a stepwise manner. It was agreed to give priority to the ACR criteria for CSS and Wegener’s granulomatosis and apply these first because they have been validated, and were specifically designed as classification criteria.3,4 In addition, the CHCC considered MPA to be a diagnosis of exclusion after CSS and Wegener’s granulomatosis. The ACR criteria for CSS have the highest specificity and were applied first (fig 2, step 1). A few patients with CSS may only be classified using the Lanham criteria and therefore this was included in the first stage.12 It was recognised that some patients clinically diagnosed with other vasculitis might be classified as having CSS, but the number of patients affected was thought to be very small and the effect would be the same in each centre applying the algorithm. Classification algorithm. ACR, American College of Rheumatology; CHCC, Chapel Hill Consensus Conference; cPAN, classic polyarteritis nodosa; CSS, Churg–Strauss syndrome; MPA, microscopic polyangiitis; MPO, myeloperoxidase; PR3, proteinase 3; polyarteritis nodosa; WG, Wegener’s granulomatosis. The second stage was to classify Wegener’s granulomatosis (fig 2, steps 2a–d). The ACR criteria were applied first as they have been validated with high specificity and sensitivity.3 Then the CHCC definitions were applied using only the strict histological definitions, not surrogate markers or ANCA. For a classification of CHCC Wegener’s granulomatosis, there had to be evidence of granulomatous change on biopsy. Small-vessel vasculitis alone would be classified as CHCC MPA. The next stage was to distinguish between Wegener’s granulomatosis and MPA. Surrogate markers for Wegener’s granulomatosis were defined. A patient was to be classified as having Wegener’s granulomatosis if there were surrogate markers for Wegener’s granulomatosis and histological evidence compatible with MPA. If histological evidence was not available but surrogate markers were present and ANCA (either c/pANCA or proteinase 3/myeloperoxidase (MPO)-ANCA) was detected, then the patient was classified as having Wegener’s granulomatosis. The third and fourth stages were to distinguish between MPA and classic PAN using the CHCC definitions for MPA and cPAN and surrogate markers for renal vasculitis and ANCA (fig 2, steps 3 and 4). The presence of histologically proved small-vessel vasculitis or glomerulonephritis differentiates MPA from cPAN. ANCA was considered to be a feature of MPA and not cPAN.15 The ACR criteria for PAN were not included in the algorithm because they have relatively poor specificity6 and many patients classified as ACR PAN also fulfil other classification criteria (fig 1). Before entering the algorithm, a patient must fulfil the entry criteria for a clinical diagnosis of AAV or PAN (box 1). The key feature is that the patient must have a clinical condition compatible with AAV or PAN and that no other condition is more likely. The algorithm is to be applied using clinical features that have “ever” been present during the course of the disease, not only at diagnosis. The patient should have been followed for at least 3 months where possible. Patients who do not survive for 3 months or are lost to follow-up should be included, provided they are considered to have a clinical diagnosis of AAV or PAN. The following provisos were made for the application of the classification scheme: (1) ACR criteria must be applied strictly—that is, peripheral blood eosinophilia must be >10% (or >1.5×109/l) for CSS and fixed infiltrates must be present on chest x ray for >1 month for Wegener’s granulomatosis3; (2) CHCC definitions refer to the histological definitions only and should not include the use of ANCA or surrogate markers7; (3) surrogate markers for Wegener’s granulomatosis (granulomatous disease) refer to symptoms suggestive of granulomatous disease affecting the upper and lower respiratory tract (in all cases other causes must be excluded; box 2). 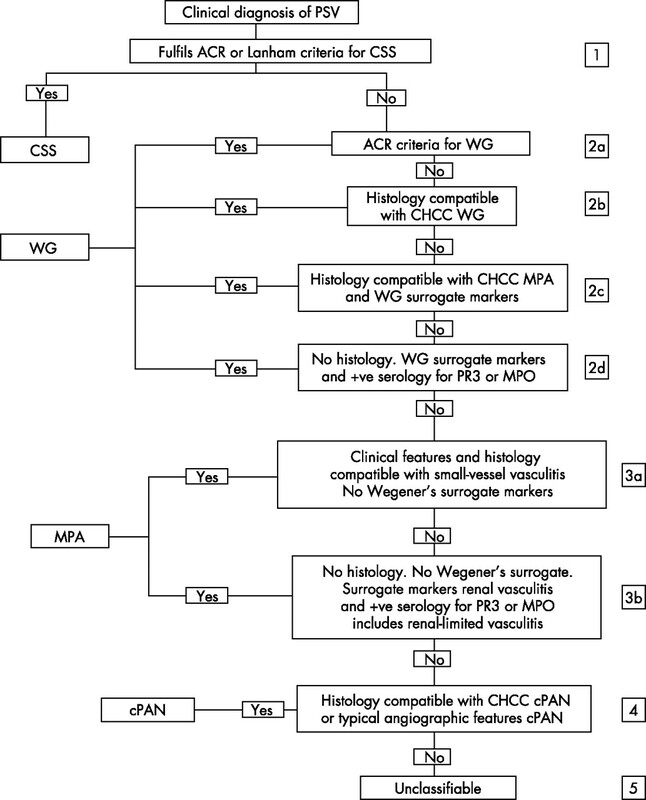 Only one surrogate marker is necessary to support a diagnosis of Wegener’s granulomatosis. (2) Face validity was tested by each member of the group (except Norwich) using 20 of their own cases with a known clinical diagnosis of AAV/PAN. After stages (1) and (2), minor modifications to the algorithm were made, including adding the Lanham criteria at step 1. (3) The algorithm was then tested using paper cases. A panel of 80 paper cases was developed. These were adapted and modified from a collection of paper cases originally written for evaluation of the BVAS scoring system for systemic vasculitis. The distribution of disease subtypes in the 80 cases represents the relative frequency with which they occur in many communities: Wegener’s granulomatosis > MPA > CSS > PAN. Within the panel, there were some cases that did not fulfil the entry criteria and some that were unclassified using the algorithm. Each classifier was sent 20 cases randomly selected from the 80 cases; again the proportions reflected the disease frequency in the community. Each classifier was asked to classify each case as Wegener’s granulomatosis, MPA, CSS, PAN or unclassified. The results from each classifier were then assessed against a standard classification that was agreed by consensus between RW and SL after circulation of the cases. Agreement was assessed by calculation of the percentage agreement and the unweighted κ coefficient. A second meeting was held in January 2006 to agree on any modifications that might be required after the validation exercise. Ethical committee approval for the study using the Norwich cohort of patients was obtained from the Norwich Local Research Ethics Committee. By consensus, an algorithm was constructed using the principles outlined above. Figure 2 shows the final version of the algorithm. There are four exits from the algorithm (CSS, Wegener’s granulomatosis, MPA, cPAN). There are however four possible routes to Wegener’s granulomatosis and two to MPA. The initial face validation and application to the cohort of 99 patients resulted in some minor modifications, mainly to the wording. No changes were made to the sequence of the steps. After the first application, three patients with CSS were unclassified in line with previous experience.12 The Lanham criteria were therefore added to step 1. After this change, each patient was successfully classified to a single diagnosis (Wegener’s granulomatosis 56, CSS 19, MPA 24, cPAN 0) and there were no unclassified patients. The algorithm was then used to classify 20 cases in each centre; there was good agreement between the classification produced by the algorithm and the clinical diagnosis. However, some minor changes were necessary. Step 2d was amended to recognise that the occasional patient with Wegener’s granulomatosis is pANCA/MPO-ANCA positive. Step 3a was modified to include “clinical features and histology compatible with CHCC MPA”. Renal limited vasculitis was added to step 3b. Step 4 was changed to include angiographic features of PAN. After these changes, the classifiers were sent a total of 238 paper cases. There were 12 classifiers, all experienced in the diagnosis and classification of patients with vasculitis (six rheumatologists, two nephrologists, two internists, one epidemiologist and one clinical immunologist). Two classifiers were inadvertently sent only 19 cases. Compared with the standard classification, agreement was obtained in 88 of 95 (92.3%) cases of Wegener’s granulomatosis, 86 of 92 (93.4%) cases of MPA, 21 of 22 (95.4%) cases of CSS, 10 of 13 (76.9%) cases of PAN, 5 of 6 (83.3%) excluded cases and 8 of 8 (100%) unclassified cases. The overall percentage agreement between the participants and the standard was 91.5%. The unweighted κ statistic was 0.885 (95% confidence interval 0.836 to 0.935), suggesting very good agreement between the participating classifiers and the standard. The paper case exercise disclosed several minor difficulties, including lack of clarity of the minimum urinary abnormality that is acceptable as a marker of renal involvement (degree of haematuria/proteinuria) and the number of surrogate markers necessary for Wegener’s granulomatosis. These have been modified in the final version of the guide to the algorithm (box 1, box 2). Using a consensus technique we have devised a practical method of classifying patients with AAV or PAN. The data presented here represent the first attempt to develop a validated, coherent approach to the use of the ACR criteria and the CHCC definitions in epidemiological studies. The approach adopted uses a sequence of steps to place any patients fulfilling the entry criteria into a single category. The proposed algorithm seems to be a consistent way of classifying patients with AAV into single categories with a minimum of unclassified patients. The high level of agreement between the classifiers and the standard diagnosis confirms the validity of our approach and suggests a high degree of interclassifier reliability. The validation process produced some minor changes to several steps, but no major rearrangement of the sequence, suggesting that the approach using validated ACR criteria for CSS and Wegener’s granulomatosis as the initial steps is both logical and correct. Progression down the algorithm results in greater reliance on histology, ANCA and surrogate markers, and less on validated criteria. The Lanham criteria for CSS were included because the past experience of the Norwich group and the validation using the 99 cases showed that a few cases of CSS are classifiable only using the Lanham criteria. We accept that these have never been formally validated for this purpose. A 3-month period with disease was included to improve the certainty that a patient has vasculitis and not some alternative disease process mimicking vasculitis. Patients who do not survive for 3 months or are lost to follow-up should be included, provided they fulfil the requirements given in box 1. We have incorporated ANCA status, although it is not included in the CHCC definitions or ACR criteria. The importance of ANCA status was recognised by the CHCC; ANCA is used by many clinicians as a marker for Wegener’s granulomatosis, CSS or MPA, especially in situations where a biopsy cannot be obtained. Therefore, its inclusion improves patient inclusion. Ideally, both indirect immunofluorescence (IIF) and ELISA results should be available.16 A pANCA with negative proteinase 3-ANCA or MPO-ANCA specificity by ELISA has a low specificity for vasculitis. Therefore, IIF positivity alone should be accepted as a marker of vasculitis only if an ELISA result is not available. For epidemiological studies over many years, complete data may not be available, but most units started using ELISA assays in and around 1995; hence we suggest that IIF with ELISA be accepted only for the period before 1995. We did not set out to establish new criteria for AAV or PAN, but to use existing criteria or definitions. One potential criticism of this approach is that because there are no validated criteria for MPA we gave primacy to Wegener’s granulomatosis and CSS, thereby possibly reducing the frequency of MPA. This was, however, the approach adopted by the CHCC. We have used surrogate markers and ANCA in the algorithm, although neither was included in the ACR criteria or in the CHCC definitions. The CHCC accepted the concept of surrogate markers but did not provide a list of markers. We have developed by consensus a list of markers for Wegener’s granulomatosis, reflecting those features most typical of Wegener’s granulomatosis not occurring in MPA. It should be emphasised that the algorithm was developed for the express purpose of enabling comparison of epidemiological data across different countries. Observed differences in incidence and prevalence could then be attributed to variation in genetic or environmental factors, without confounding by classification differences. In conclusion, we have developed by consensus a method of using both the ACR criteria and the CHCC definitions for epidemiological studies in AAV and PAN. Clear entry criteria are required before using the algorithm, to avoid inclusion of patients with other conditions. The algorithm incorporates surrogate markers for vasculitis and ANCA. The algorithm needs to be tested further in patients with less-well-defined disease, especially to assess whether patients with, for example, HSP might be classified. We thank Dr Raashid Luqmani (University of Oxford) for help with preparation of the paper cases, Dr Lee Shepstone (University of East Anglia) for statistical advice and Dr Susan Hogan and colleagues at the University of North Carolina for help with the validation and constructive criticism. We thank the European Medicines Agency (EMEA) for funding the consensus meetings. Watts RA, Lane SE, Scott DG, Koldingsnes W, Nossent H, Gonzalez-Gay M, et al. Annual incidence of primary systemic vasculitis in three regions of Europe (letter). Ann Rheum Dis2001;60:1156–7. Selga D, Mohammad A, Sturfelt G, Segelmark M. Polyarteritis nodosa when applying the Chapel Hill nomenclature – a descriptive study on ten patients. Rheumatology. 2006;45 :1276–81. Fries JF, Hunder GG, Bloch DA, Michel BA, Arend WP, Colabrese LH. The American College of Rheumatology 1990 criteria for the classification of vasculitis: summary. Arthritis Rheum1990;33:1135–6. Leavitt RY, Fauci AS, Bloch DA, Michel BA, Hunder GG, Arend WP, et al. The American College of Rheumatology 1990 criteria for the classification of Wegener’s granulomatosis. Arthritis Rheum1990;33:1101–7. Masi AT, Hunder GG, Lie JT, Michel BA, Bloch DA, Arend WP, et al. The American College of Rheumatology 1990 criteria for the classification of Churg Strauss syndrome (allergic granulomatosis and angiitis). Arthritis Rheum1990;33:1094–100. Lightfoot RW, Michel BA, Bloch DA, Hunder GG, Zvaifler DJ, Mc Shane DJ, et al. The American College of Rheumatology 1990 criteria for the classification of polyarteritis nodosa. Arthritis Rheum1990;33:1088–94. Jennette JC, Falk RJ, Andrassy K, Bacon PA, Churg J, Gross WL, et al. Nomenclature of systemic vasculitides. Proposal of an international consensus conference. Arthritis Rheum1994;37:187–92. Hagen EC, Daha MR, Herman J, Andrassy K, Csernok E, Gaskin G, et al. The diagnostic value of standardised assays for ANCA in idiopathic systemic vasculitis: results of an international collaborative study. Kidney Int1998;53:743–53. Jayne D, Rasmussen N, Andrassy A, Bacon P, Cohen-Tervaert JW, Dadoniene J, et al. A randomized trial of maintenance therapy for vasculitis associated with antineutrophil cytoplasmic autoantibodies. N Engl J Med2003;349:36–44. Sorensen SF, Slot O, Tvede N, Petersen J. A prospective study of vasculitis patients collected in 5-year period: evaluation of the Chapel Hill nomenclature. Ann Rheum Dis2000;59:478–82. Lane SE, Watts RA, Barker THW, Scott DGI. Evaluation of the Sorensen diagnostic criteria in the classification of systemic vasculitis. Rheumatology2002;41:1138–41. Reid AJC, Harrison BDW, Watts RA, Watkin SW, McCann BG, Scott DGI. Churg Strauss Syndrome in a district hospital. Q J Med1998;91:219–29. Lanham JG, Elkon KB, Pusey CD, Hughes GR. Systemic vasculitis in asthma and eosinophilia: a clinical approach to the Churg Strauss Syndrome. Medicine (Baltimore)1984;63:65–81. Lane SE, Watts RA, Scott DGI. Primary systemic vasculitis: clinical features and mortality. Q J Med2005;98:97–112. Guillevin L. Polyarteritis nodosa and microscopic polyangiitis. In: Ball GV, Bridges SL, eds. Vasculitis. Oxford: Oxford University Press, 2002:300–20. Savige J, Dimech W, Fritzler M, Goeken J, Hagen EC, Jennette JC, et al. Addendum to the International Consensus Statement on testing and reporting of antineutrophil cytoplasmic antibodies. Quality control guidelines, comments, and recommendations for testing in other autoimmune diseases. Am J Clin Pathol2003;120:312–18. Kallenberg CGM. Churg Strauss syndrome: just one disease entity? Arthritis Rheum2005;52:2589–93.